When you're having a party, you need to determine the amount of food you need. You want your guests to have enough to eat so they feel satisfied, but you don't want a ton of leftovers. Calculating food amounts is also a great way to help determine the budget for your party. There is no magic formula or standard for exactly how much food you'll need for a party. Some people will eat more or less than expected, a few guests might not show up, or someone might even bring an extra person or two. It's best to overestimate the amount of food by just a bit than to run out. Following some general guidelines when planning your meal can help you determine the right amount of food. 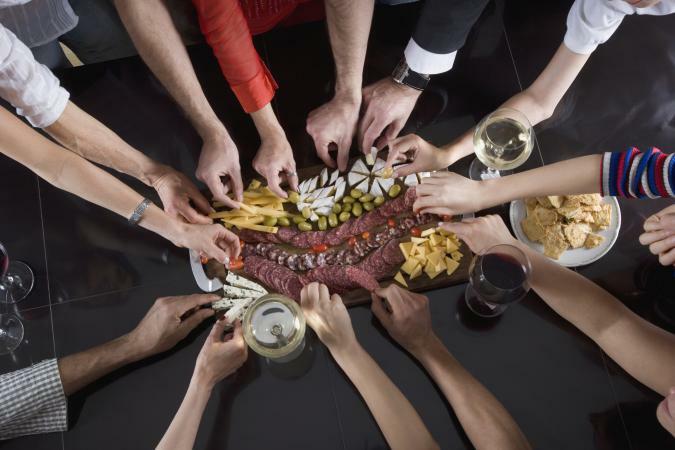 Appetizers - For parties in which only appetizers and finger foods are being served, base your estimate on five to eight appetizers per person, per hour. If there is a meal included, you can cut back to three or four per person per hour before the meal. Offer more types of appetizers for a larger crowd. Full meals - If you're offering a choice of dishes, try to anticipate which one will be the most popular and have extras on hand. Serving sizes will depend on the dishes, so if you go the buffet route, make sure you have enough for everyone to sample each dish. Side dishes can be tricky, but you can estimate about four ounces of each dish as a serving. Prepared salads - For potato, pasta, or other prepared salads, one gallon will feed 20-25 people. Green salad - For leafy vegetable salads, plan on about one cup per person, before dressing. Fruit and veggie trays - For fresh fruit, about one half cup per person should do the job. With veggies, estimate about eight to ten pieces per person. Have plenty of dip available as well. Desserts - It's best to offer desserts as single servings, so you can easily calculate how many you need. Have some extras on hand for big eaters or those with a particularly sweet tooth. One 9" layer cake will serve 10 to 12 people; one 9" pie will serve 6 to 8. A three hour party is a good place to start; if your party will be longer, change the calculations to accommodate the additional time. Plan for a main dish (chicken, turkey, beef, pork, ham, or casserole) plus salads, sides, desserts, and drinks. Desserts can be the star of the party, so be sure you have enough so everyone ends on a sweet note! Always err on the side of too much food. It's much easier to take home some leftovers or send them home with your guests than to let people go home hungry. Include both "heavy" and light options. Some people will be hungrier than others, so offering more substantial food items will allow them to fill up without consuming more of each dish. If you think a certain dish will be very popular, plan to make or purchase extras. Be wary of suggested serving sizes on packaged foods. Keep in mind whether the servings will be meal or snack-sized and then determine yourself how many servings are in each package. The number of guests is the most important factor, but there are a few other considerations, too. The number of guests at your party will determine the amount of food you'll need. Make sure you ask guests to RSVP, but if you don't hear from someone, it's safest to assume he or she will attend. The time of day dictates the types of food you'll serve. If the party is scheduled at mealtime, for example, you'll be expected to serve something substantial. If your party is at night or mid-afternoon, you can serve just appetizers and snacks. 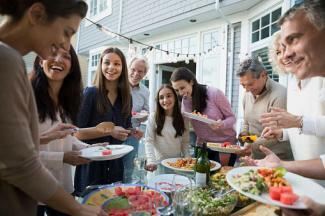 You wouldn't think that the age range of the guests would be important for party planning, but consider this: How much food would you prepare for a group of ten teenagers? Now, how much food would you prepare for ten senior citizens? Generally, there can be a vast difference in appetites between different age groups. If you're planning on serving a meal, or have lots of food to choose from at a buffet table, you can cut back on the snack foods and appetizers for your party. Conversely, if you're relying on finger foods only to fill up your guests, you'll need to have more of them on hand. It's almost impossible to know precisely how much food you'll need for a party, but with these guidelines, you'll be able to give yourself a good idea of how many servings of each item you should plan for. Err on the side of having a few leftovers if you're not sure the RSVPs are accurate; it's always best to have a little extra than to run out!